OCAG's Fall 50/50 Raffle tickets are NOW ON SALE!! Only 500 tickets to be sold, so don't hesitate as they are going to go fast!! Drawing is December 1, 2018 at 3 PM. Tickets are $20.00 each & they can be purchased at the Guild or by mail (include your name and phone number). 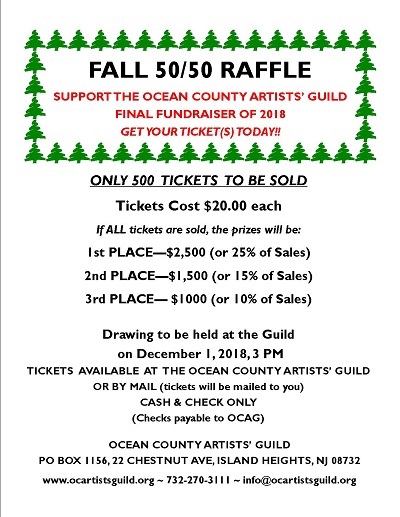 Make checks payable to OCAG and mail to Ocean County Artists Guild, PO Box 1156, 22 Chestnut Ave, Island Heights, NJ 08732. You need not be present to win, but we would love to have you stop by to do some early Christmas shopping in our Holiday Boutique.